In the mythology of J.R.R Tolkien, the warg is the wolf of Rhovannian, allied with the Orcs. The warg is larger than a regular wolf, and has a sort of verbal language. As you might suspect, being allied with the orcs and all, they're not very nice creatures. In the A Song of Ice and Fire novels by George RR Martin, wargs are humans who can enter the mind of a wolf. However, this site has nothing to do these fictional works, nor with the warg in Norse mythology. It is a personal domain owned by me, Fredrik Warg, who's only got my last name in common with the other kinds of wargs. warg.org is my third web home. The first was hosted by the Ludd computer society @ LTU and was live from September of 1994, back when the graphical browser was a brand new thing (anyone else remembers NCSA Mosaic? ), and just after the most hated HTML tag of all time, the <blink> tag, was inadvertently introduced. 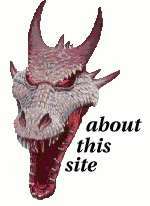 The original page was replaced with the warg.nu domain in 1998, and from 2004 I've mainly used warg.org. Content has varied, and at the moment it leans towards minimalism. The information on this site is provided to you "as is" without warranty of any kind. The entire risk as to the use of the information is assumed by you. The author specifically does not make any representations or endorsements, regarding the use of, the results of, or correctness of the information (including but not limited to it's appropriateness, accuracy, reliability, currentness, or otherwise.) In no event will the author be liable for direct, indirect, incidental or consequential damages resulting from any defect in this information even if it has been advised of the possibilities of such damages. Nostalgia note: This is a sligthly modified disclaimer from an Amiga tech manual.